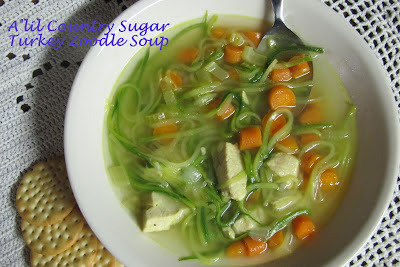 Everything in the Kitchen Sink: Foodie Friends Friday: A'lil Country Sugar - Zoodles! 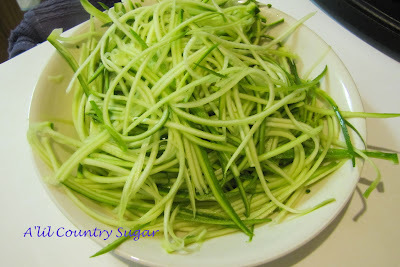 Foodie Friends Friday: A'lil Country Sugar - Zoodles! This week for Foodie Friends Friday, I pulled Angie from A'lil Country Sugar. Using a julienne peeler, Angie made gorgeous looking "zoodles": zucchini noodles! This is the perfect time of year to use the zoodle, as they will be popping up shortly at the farmers markets. Fresh and local, they will have the best flavor. Angie used the zoodles in a soup, but I could see these blanched and used in a summer "pasta" salad! And to see the rest of the posts head to Foodie Friends Friday! PS: A little bit of self promotion, my Mango and Beef Stir Fry was featured at Foodie-a-Saurus. Go check them out to see all of the other bloggers they feature! Thank you for the great shout-out. I want to let you know that I made your Onion and Green Apple Quick Pickle today. I'm going to be adding your recipe along with my foodie friend post next week. I decide I'm going to put it on top of some shredded cabbage to represent coleslaw. I loved all the flavors that were mixed together. Love this recipe! I saw it on her blog a few days ago and thought it was really interesting! Enjoy!